TIJUANA, Mexico — U.S. border agents fired tear gas on hundreds of migrants protesting near the border with Mexico on Sunday after some of them attempted to get through the fencing and wire separating the two countries, and American authorities temporarily shut down border crossings from the city where thousands are waiting to apply for asylum. After a few migrants tried to breach the fence separating the two countries, they were enveloped with tear gas. U.S. agents shot the gas, according to an Associated Press reporter on the scene. Migrants sought to squeeze through gaps in the wire, climb over fences and peel back metal sheeting to enter. Border Patrol agents closed the pedestrian and vehicle crossing at San Diego earlier Sunday, but reopened it hours later, according to multiple tweets. The Mexican government described Sunday's events as "acts of provocation" that were "far from helpful" for the migrants' objectives. Children screamed and coughed in the mayhem of the tear gas. Fumes were carried by the wind toward people who were hundreds of feet away, not attempting to enter the U.S. Yards away on the U.S. side, shoppers streamed in and out of an outlet mall, which eventually closed. "We ran, but when you run the gas asphyxiates you more," she told the AP while cradling her 3-year-old daughter Valery in her arms. Mexico's Milenio TV also showed images of several migrants at the border trying to jump over the fence. Sunday evening, the Mexican Interior Ministry has said it would immediately deport Central American migrants who tried to "violently" breach the border and it would reinforce the border. U.S. Homeland Security Secretary Kirstjen Nielsen said U.S. authorities will continue to have a "robust" presence along the Southwest border and they will prosecute anyone who damages federal property or violates U.S. sovereignty. Many migrants hope to apply for asylum in the U.S., but agents at the San Ysidro entry point are processing fewer than 100 asylum petitions a day. Some of the migrants who went forward Sunday called on each other to remain peaceful. Earlier Sunday, they appeared to easily pass through the Mexican police blockade without using violence. A second line of Mexican police carrying plastic riot shields stood guard outside a Mexican customs and immigration plaza, where the migrants were headed. They carried hand-painted American and Honduran flags while chanting: "We are not criminals! We are international workers!" "We can't have all these people here," Mujica told The Associated Press. 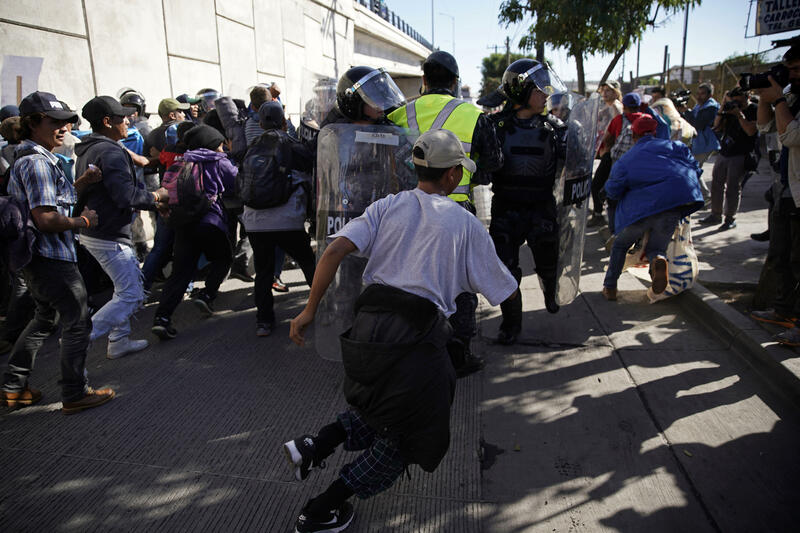 Tijuana Mayor Juan Manuel Gastlum on Friday declared a humanitarian crisis in his border city of 1.6 million, which he said is struggling to accommodate the crush of migrants. U.S. President Donald Trump tweeted Sunday to express his displeasure with the caravans in Mexico. Mexico's Interior Ministry said Sunday the country has sent 11,000 Central Americans back to their countries of origin since Oct. 19. It said that 1,906 of them were members of the recent caravans.